Visitors from around the world descended on Munich for the latest edition of the international trade fair, which showcased a diverse range of equipment developments. 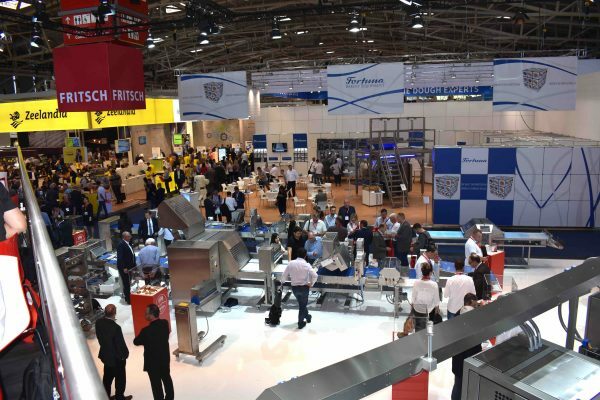 From advanced robot picking lines for packaging systems, through to advanced ingredients, live demonstrations, baking and confectionery contests, it offered an event-packed week. According to the event’s organisers, there were a total of 76,800 visitors across the trade show, with a total of €2.1 billion worth of contracts being signed at the event, which is held every three years. There were 1,373 exhibitors for the fair, with many rating the virtual bakery tours of international baking operations, and the speakers corner events addressing key topics as being especially notable elements of the six-day trade show in Munich. Among the most notable equipment releases was Bühler’s ContiMixTM dough extruder, combining the mixing and the kneading process. The double-shaft extruder targets the market for the production of consistent doughs for laminated products like puff pastry sheets, as well as for flat or shaped products. Thanks to a greater dough yield by up to nine percent, an increased plasticity, and the elimination of additional process steps, the ContiMixTM even allows direct savings. Another key release within the equipment series was its Swakt-Eco oven, reportedly capable of producing 60 wafer sheets per minute, equivalent to 1,100 kilograms of wafer blocks. Its enhanced heating system means gas consumption is reduced by up to 25 per cent, while emissions are cut by up to 90 per cent. Daniel Troxler, marketing director at Bühler, explained that this year’s iba marked a particular milestone, being the first trade show which it has exhibited jointly with bakery equipment business Haas, which it recently acquired. He said: “From the first moment that the doors opened on the fair, our stand has been full – people have come to see what benefits that the combined businesses can offer them. We have tried to offer a range of solutions across Bühler’s grain and enrobing business and the applications offered by Haas, and we’ve had some very good reactions,” explained the sales director, who said there had been considerable focus placed at iba on presenting a potential way forward for the newly-joined companies. Speaking on the recent acquisition move, his colleague Thomas Breg, who has worked for Haas, felt the two businesses were integrating well, adding that it had been a sense of ‘feeling like a family’ between the respective firms. While he acknowledged there would be challenges ahead, he expressed confidence that it would be a successful union of the two companies. 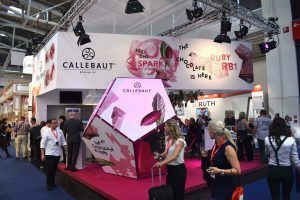 There were a number of virtual reality displays throughout the show, including the Callebaut stand, which offered a special presentation for its RB1 gourmet version of ruby chocolate aimed at professional chefs. Marketing manager, Kerstin Uhrig said: “There has been an amazing reaction to ruby chocolate since its launch in Shanghai last year. We of course felt that people would like it, but we have had a positive reaction around the world. “The response to ruby RB1 has also been overwhelming. We’ve worked hard on creating a colourful booth here, and we believe that we have created something very special in terms of the taste of ruby chocolate, and we wanted to get that across with our appearance at iba through showing its different applications. She added that the company had focused its efforts on demonstrating that ruby is an entirely natural product from a specific cocoa bean, which has been delivered through a unique recipe, which she hoped that consumers were now beginning to gain a fuller appreciation of in their understanding of what is being considered ‘the fourth category’ of chocolate. 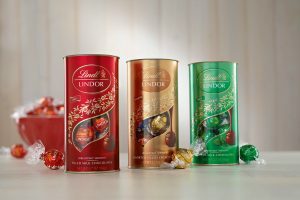 The marketing manager said that she believed the company had been fully transparent in discussing the origins of the ruby cocoa bean, which is sourced from its core markets in Africa as well as South America, explaining that its development process of over a decade had in the company’s opinion be well worth the investment. She added this was especially the case given the addition of its RB1 variety, which opens up the ruby brand for an even broader range of uses for chocolatiers and professional chefs. This has already lead to the development of authorised varieties including Rubina in Switzerland. Meanwhile, Michael Wolf, director of German-based Wolf machines specialising in confectionery equipment, also reported a good level of industry interest. Its series includes tempering machines, coating cabins, enrobers and depositors, as well a number of decorating and sprinkling systems. Fellow German business Walterwerk Kiel also believed the experience had been worthwhile. Markus Bartels, of the company, said: “This is the first time that we have participated- we have been at Anuga and Interpack in Germany, so I think the show has been quite good, and we have had some contact from customers which we will be following up, and it is good that we are able to do this at the fair. This has been a record-breaking year for the company, with the largest order book we’ve had has seen us increase our capacity. We’ve also launched a new machine that is more hygienic in its design, as well as lowering energy consumption,” explained the director, who said that its C series had been its most successful this year. From speaking to a number of exhibitors at the event, Confectionery Production found there were plenty of new systems and processes on display to offer some inspirations to visitors. Netherlands-based Tanis Food Tec produced a particularly striking pink-themed stand, showcasing the company’s latest series of equipment, which includes its system for delivering automated cream filling for Oreo sandwich biscuits. The equipment’s capper technology allows for a wide variety of products to be created, including cream, marshmallow, jelly, caramel and marmalades. The company’s owner, Peter Tanis, revealed there had been “a good level of response” to its present range, and that the event had proved a valuable platform for talking to its customers. 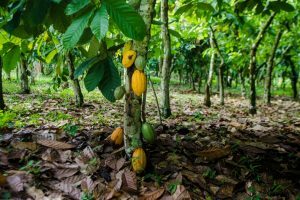 Fellow Netherlands firm Caotech, which specialises in the development of ball mills and conches within the cocoa processing sector, also felt the event had lived up to expectations. For the trade fair, the company showed a Chococon chocolate/cream production unit with a laboratory ball mill and a laboratory chocolate conche. 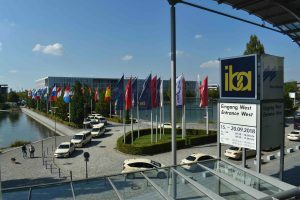 Olaf Schepel, sales and marketing manager, commented: “This is the firs time that we have exhibited here at iba and we’re pleased with the position that we have, within a hall alongside others within our sector. The amount of visitors we’ve had has been very good, and we’ve made some good contacts. He added that the company’s had prided itself on maintaining high production standards, and he said that customers had particularly valued the company’s focus on after-sales servicing. The UIBC Junior World Championship of Confectioners was also held at the event, with Haoran Lyu of China declared the winner over seven competitors. Participants from Taiwan, Iceland, Norway, Brazil, China, Japan, and Germany conjured up pâtisserie artwork at the highest level. The UIBC Junior World Championship of Confectioners was the grand finale following the UIBC Cup of Bakers and the German Championship of Master Bakers — for 86 per cent of the trade fair audience, these live professional competitions were highlights of the fair. Meanwhile, Ankit Kaushal, director of Indian-based biscuit manufacturing firm New Era Machines, said the event had seen a respectable level of footfall, adding that the business gained some notable leads. For her part, Dr Monika Eller, of oven specialists Miwe enthused that its stand had gained interest from new and existing customers from around the world. She said: “We are showcasing everything from deck ovens and vacuum conditioning baking systems for continuous production through to thermal oven equipment, as it’s important to us that we are able to offer solutions to all sections of the market. One of the most striking stands during the event came from the Netherlands-based Tromp group, which featured a number of its latest equipment series including pizza production, sheeting and depositing systems, and other bakery equipment through its Den Boer brand. 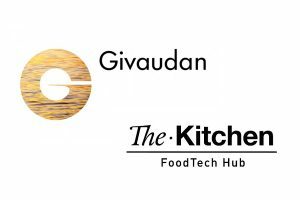 Erik Smink, of the company, explained the business had set out to create a presence at the event that both showcased its full range and demonstrated its finished product potential with cafe bar facilities serving products delivered using its equipment. Among the key equipment releases at iba, was a new flow packaging system from the Italian-based Sacmi Chocolate and Packaging division, formerly known as Carle and Montanari-OPM and CM-FIMA. The business explained the system has designed to operate with products such as baked items that have ingredients on their surface or irregular edges. According to the manufacturer, the configuration includes the handling of biscuits, which have been previously grouped into stacks through a loading cell equipped with fast picker Delta robots. Antonella Cavalieri, marketing manager, said: “This is an exciting period for the business in becoming part of the Sacmi group, that has shown that it wants to invest in our company, and we will be keeping our existing three production facilities.” She added that there had been an encouraging response to its latest packaging system, which was being demonstrated throughout the event. Within the packaging sector, German-based business Theegarten-Pactec was also present at the event, showcasing its range of equipment alongside WDS, offering a number of systems for the confectionery segment. Theegarten’s latest high-performance line, the EK4 is being released this year, capable of wrapping up to 2,300 boiled sweets per minute in double-twist style, with its continuous operating design said to be particular gentle on products it is processing, including hard candies. As one of the businesses with the longest associations with iba, Fritsch has made a particular point of being present for each edition of the show. Head of marketing Anna-Maria Fritsch, said: “We’ve been coming to iba since 1961 as an artisan exhibitor when it was relatively small, and we have grown with it, including being one of the first to introduce automated systems in the 1980’s. “We always try to do something special for customers with the live demonstrations we show, and we have had some very good orders this year – which is not something that is typical for shows these days. For this fair, we have been showing our new soft dough sheeting system, as well as a line for croissants, which we first introduced three years ago, but have now optimised it, and it is capable of operating at150 strokes per minute. Elsewhere at the show, there were plenty more innovations to be seen, including Bunge Loders Croklaan, with its latest product, Delica Pro Gold. This is a liquid, non-hydrogenated margarine without E-numbers, and contains no artificial colours or flavours. – the fat formula reportedly has exceptional functionality, and was demonstrated at iba with some especially fine, and surprisingly light cakes. “The real challenge was to create a liquid margarine without emulsifiers”, explains Bernd Brinkmann, innovation director EMEA of Bunge Loders Croklaan. “We overcame this challenge by adapting the formulation with a virgin oil mixture with high emulsifying properties combined with a new production process,” explained the director of the product, which was just one of many that stood out during the week.